Aria Naveed is a human with a special ability. She's a pyrokinetic, which means Aria can control and produce fire. Aria works as a mercenary and is investigating the disappearance and murder of a young shifter child. A few years ago the Awakening happened. This means that the supernatural beings that walk the earth are no longer hidden in the shadows. When Aria finds out that the child was murdered by a vampire, a war is at hand between the vampires and the shifters. Aria works together with James on this case, James is the hunter of the shifter pack. Declan Valkenaar is the Alpha of the shifters. He leads his pack with admirable control. Declan is dangerous and calculated, but he’ll also go through great lengths to protect his pack. When he meets Aria, after she’s been attacked, Declan finds out that she is very valuable. Because of the fact that Aria is a pyrokinetic she's a helpful ally if there would come a war between the shifters and the vampires. Fire is the biggest weakness for vampires, so Aria has the power to wipe them out with no effort at all. Aria lost her biological parents and this formed her. Aria is tough, independent and she doesn’t work well with others. If you are lucky enough to be accepted in Aria’s inner circle she will treat you like family. Behind all her toughness and sarcasm Aria hides that she in fact has low self-esteem. Aria makes it hard for others to love her, but when they get a glimpse of the person behind her walls they’ll connect with her immediately. Cursed by Fire is the first book of a series. 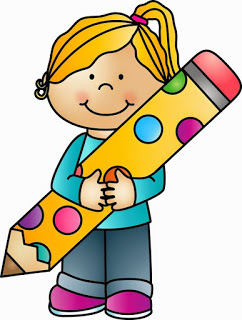 Danielle Annett's writing style has a good flow, which makes the story easy to follow. This book is filled with action, interesting main characters and unexpected surprises. 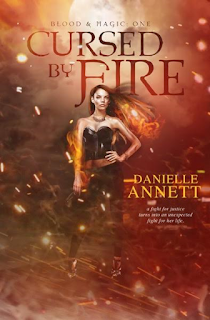 Cursed by Fire is an entertaining read. I'm glad it's part of a series, because after finishing this book I am definitely ready for more. 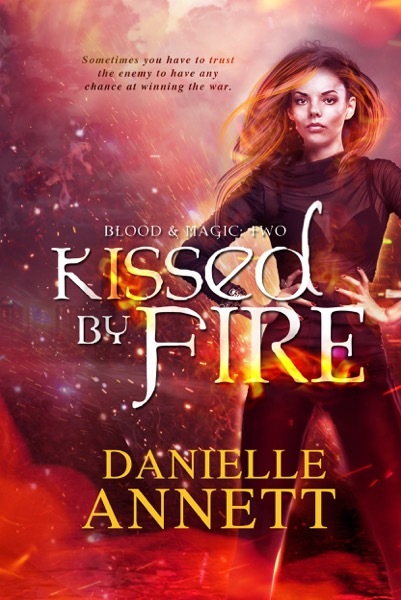 In this second book of the Blood & Magic series Danielle Annett continues writing about Aria, a pyrokineticon who's on her path to justice. After finding out who killed Daniel, a young shifter boy, and being attacked Aria now falls under the protection of the shifter pack. Aria found out some new facts that turned her world upside down. 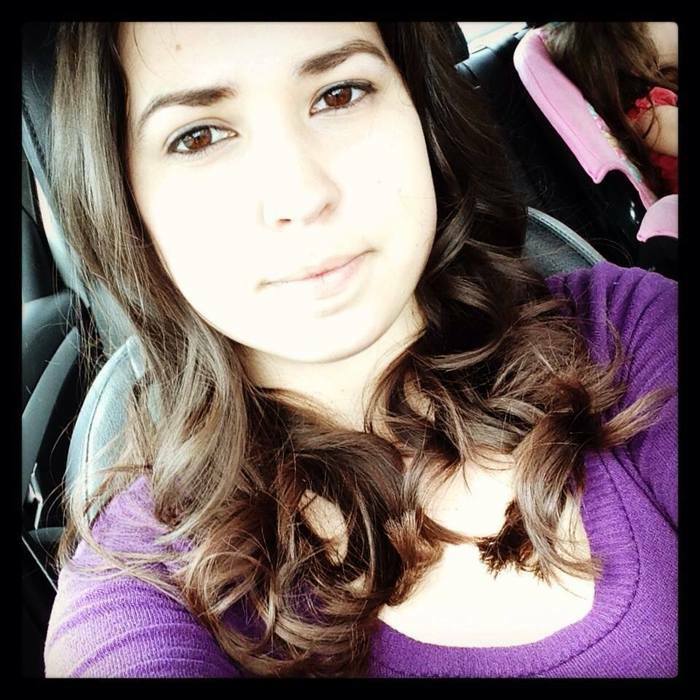 Aria is working through her grief after losing people who were close to her. She also learns that she is now the owner of Sanborn Place. This comes with extra responsibilities. Aria needs to adjust to her new world but she finds it hard to accept help. responds better if he supports her. I loved the way that their romance slowly evolves into something deeper. When more enemies join the upcoming war will they be able to survive together? Kissed by Fire is a great second book. 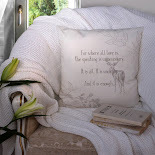 All of the creatures that Danielle Annett writes about make the story engaging and a definite page-turner. The first book and the second book of the series both have open endings, so it's necessary to read the stories in the right order. 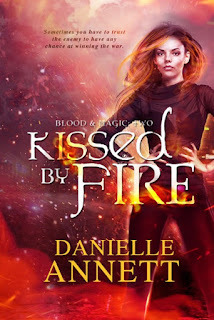 Kissed by Fire shows you more of Aria’s background and Danielle Annett reveals a lot of new secrets. The twists and turns made this book hard to put down. 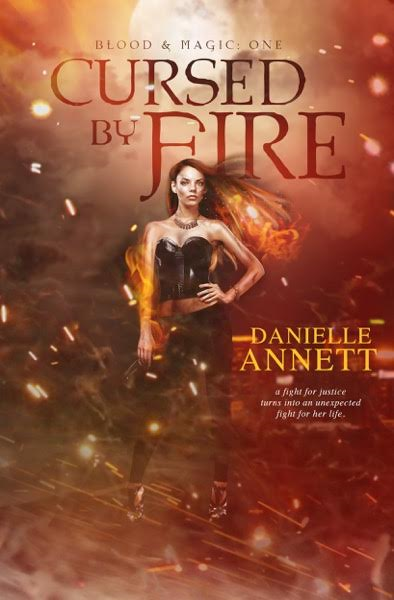 The third book in this series, Burned by Fire, will come out on September 30th and I must say that I can’t wait to find out how the story will continue. One very lucky winner will receive paperback copies of Cursed by Fire and Kissed by Fire & a $10 Amazon gift card. Fab thanks for the chance. These books sound fab! 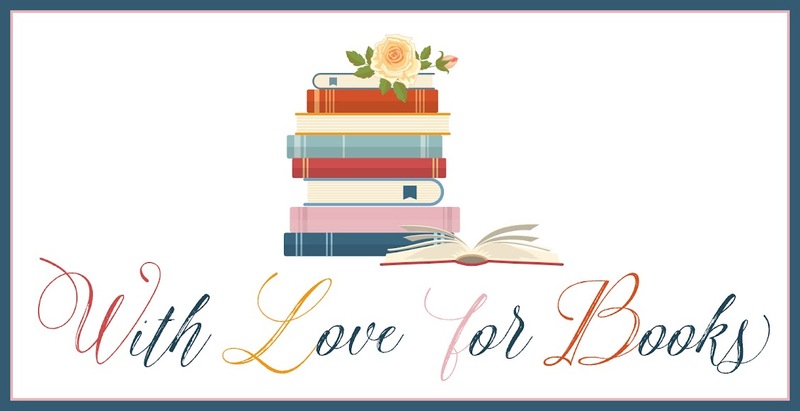 I love to read fantasy and paranormal books. This one sounds great. Sounds like a great new series! I'm always on the lookout for new paranormals. Beautiful cover; truly eye-catching. 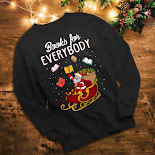 I already had the first book on my TBR list. I think I need to check it out very, very soon! These books sound so interesting! Thank you for the awesome reviews and giveaway! Awesome title and a really beautiful cover! and a $10 Amazon gift card. I haven't heard of this series but these sound like interesting books. I liked the review - looks really interesting. Great review! This sounds like a very interesting new series. Thanks for the awesome giveaway!